The Village of Machesney Park is proudly patrolled and protected by the Winnebago County Sheriff’s Department, Machesney Park Division. As with many aspects of the Village of Machesney Park, the policing is contracted out to the county. The Machesney Park Division is housed at Village Hall, 300 Roosevelt Rd, and can be accessed by citizens during normal operating hours Monday-Friday from 8:00 am-4:30 pm. To access the police department, please follow the signs around the East side of Village Hall. You may also contact the Machesney Park Division via the non-emergency line at 815-877-5519. Pete Dal Pra has been a lifelong resident of Northern Illinois, he grew up in Rockford, Illinois and graduated from Boylan High School in 1990. He attended Rock Valley College and Rockford College. Lieutenant Dal Pra’s career with the Winnebago County Sheriff’s Department began in 1996 when he was hired into Corrections. Beginning in 1997, Lieutenant Dal Pra worked as a patrol officer. In 1999 he was assigned to the Juvenile Assessment Center where he spent 3 years working with juveniles. In 2003, Lieutenant Dal Pra was promoted to Detective where he spent over 12 years, he spent nearly 4 years assigned to the Machesney Park Division. In 2016, he was promoted to the rank of Sergeant where he served as a TAC Team Sergeant and a Patrol Sergeant. In December of 2017, Dal Pra was promoted to the rank of Lieutenant. He is currently serving as the Public Safety Coordinator of Machesney Park. It is most important to Lieutenant Dal Pra that the people of Machesney Park feel that they have a voice and an active role in crime prevention in their community. He expects the Deputies to be visible and approachable to all citizens of the village. Police work is a partnership between the citizens and the Deputies, it takes effort from both sides to create an effective partnership. If you see something suspicious, please SPEAK UP! 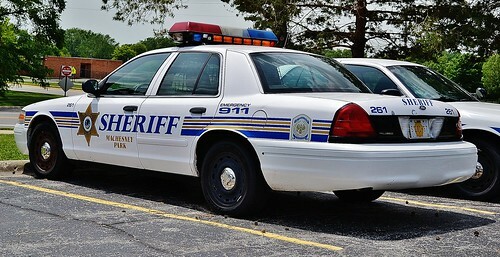 If you need a Deputy and it is not an emergency, please call 815-282-2600 and you will be connected to the Sheriff’s Department’s 9-1-1 Center. You can also reach WCSD-MPPD at Village Hall during normal business hours at 815-877-5519. If you have a police, fire, or medical emergency always call 9-1-1. As a reminder it is no longer legal to operate a motor vehicle and use a cell phone unless you are using a Bluetooth or some other type of hands free device. It is also illegal to text while driving.